List the article title in quotes after the author. The journal title goes after the article title and is italicized. 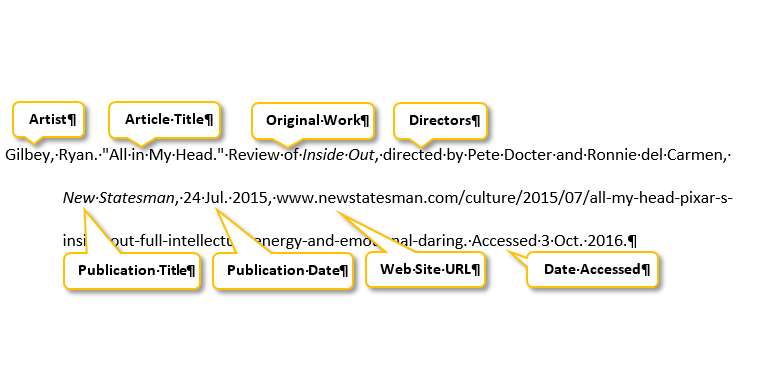 After the publication date, include the database in italics and then the DOI or permanent link to the article. After the publication date, include the Web site name in italics, then the DOI. No DOI? Include the Web link to the article and the date you accessed it. List the article title in quotes after the author. The magazine title goes after the article title and is italicized. List the article title in quotes after the author. The newspaper title goes after the article title and is italicized. If article isn't on consecutive pages, cite the section and page number where the article begins, then put "+" after the page number. If there is no author, start with the article's title, omitting a, an, or the from the beginning. The author is your professor. After the handout's title, add the description "Student handout" and the name of the college. Start with the quoted author. After the handout title, list the quoted source, description ("Student handout"), the course title, your professor, and the college. After the handout title, add the description "Student handout" and the name of the college.